I think it’s fair to say that my intense love of cheese is now very much public knowledge. From creamy Somerset brie to crumbly gorgonzola, salty feta to smoked applewood cheddar. There are very few that I don’t enjoy. I am a cheese fiend. An addict, if you will. So when I was given the opportunity to road-test a cheese & wine night, you’ll believe me when I tell you that it didn’t take much arm-twisting. None at all, in fact. The H Dubai is one of the newer hotels to crop up along the Sheikh-y Zed and, until this cheese-themed adventure, I hadn’t yet visited the spot. As someone who lives in the Dubai Marina neck of the woods, I don’t often find myself venturing much further downtown than MoE. So it was a rather refreshing change from the usual haunts. It had been an extremely long week at the office and Thursday had felt like an eternity, so I was rather relieved when 6pm finally rolled in. The evening had been etched into my diary for over a week, so the thought of a large glass of wine in my hand was quite literally getting me through the day! 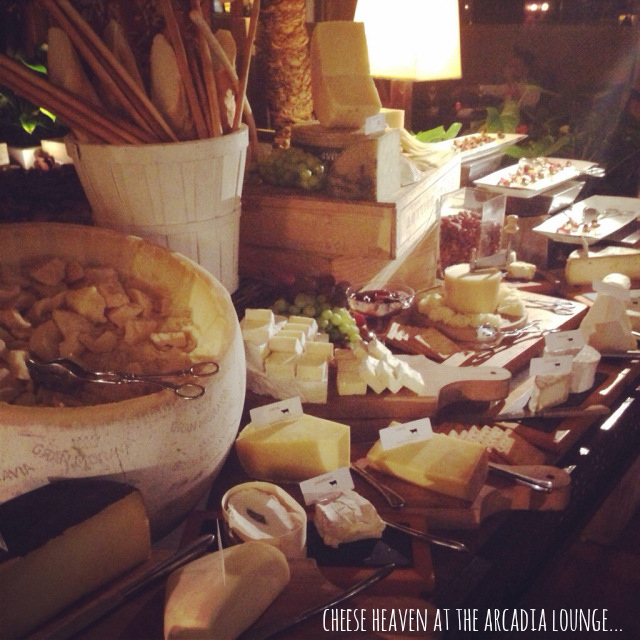 The evening was at the Arcadia lounge – a raised area in the H Dubai’s lobby. 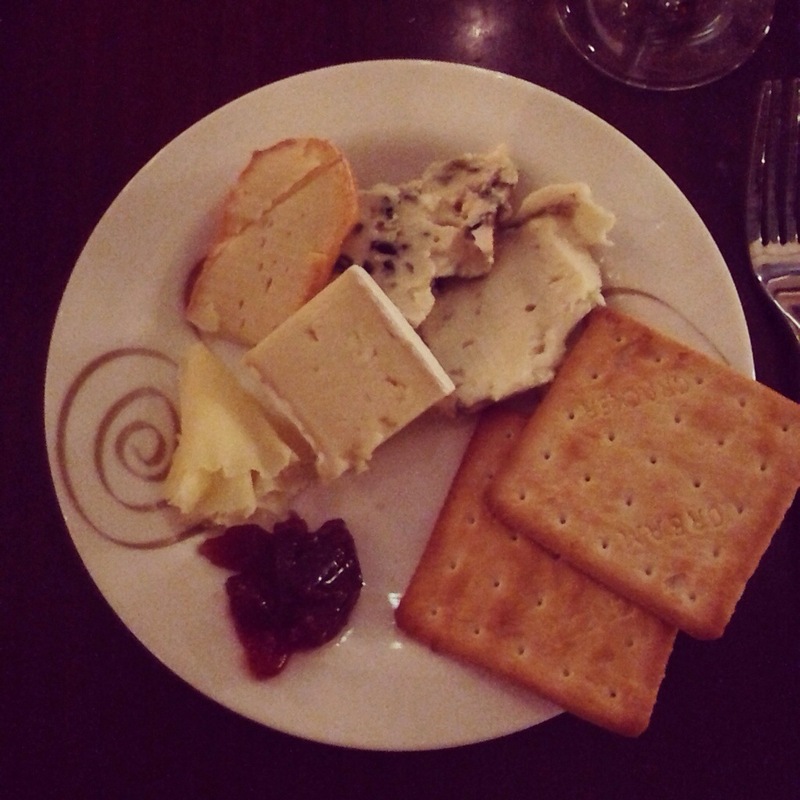 Cheese and wine in a hotel lobby? Yeah, that was my thought. But with the calming tones of a live musician in the background, a cool glass of Sauvignon Blanc in my hand, and a multi-layered cheese spread in sight, I almost forgot where I was. I sat opposite my partner in crime, and we both looked at each other and said, “well isn’t this just lovely.” Deep sigh. It really was nice to venture further afield and do something different. After a few generous sips, it was high time to investigate the cheesy wonderland. With so much on offer, I found myself alarmingly over-whelmed at first. Alas, the feeling soon passed and I was loading up my plate with an array of cheeses, crackers, fresh breads, sticky chutneys, and tapenades. Mouth watering to say in the least. 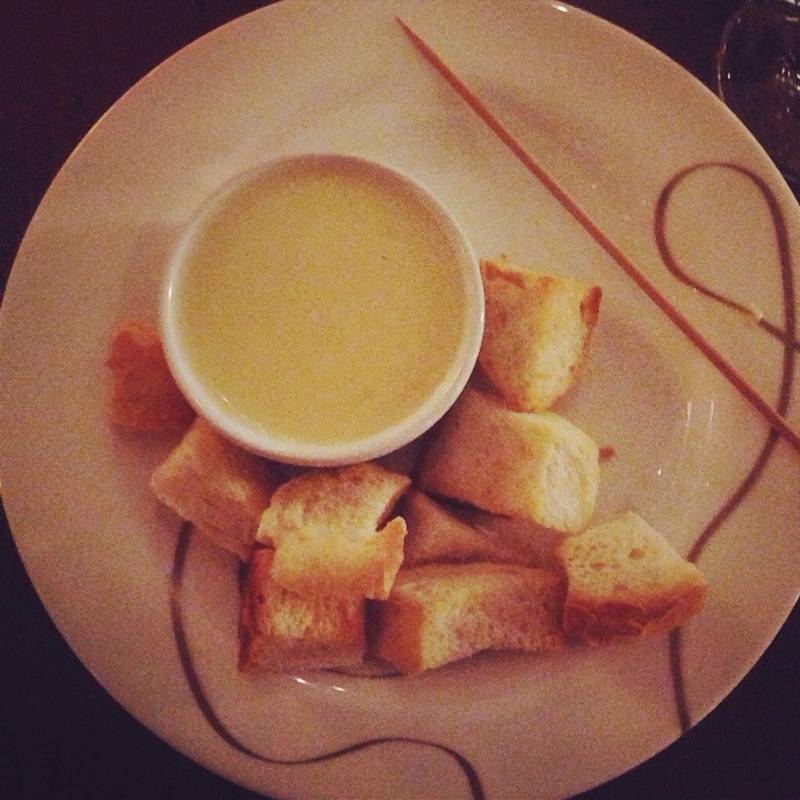 Round two was cheese fondue o’clock. This was the first time I had witnessed fondue as part of a cheese selection, but it was a glorious addition. The buffet housed a large bubbling pot of melted deliciousness, with a stack of ramekins beside. We filled a ramekin each to the brim, piled a plate sky-high with chunky croutons, grabbed a skewer, returned to our table where our glasses had been conveniently re-filled, and sunk back into our chairs. Bliss. Now I’m not going to tell you how many more trips to cheese heaven we made, for fear of you judging my ridiculously excessive consumption levels. AED 149 per head for unlimited wine and cheese from 7pm to 10pm is a pretty sweet deal in my opinion, and I definitely recommend a trip down there for a relaxed Thursday evening with a close chum. The Arcadia also hosts an Italian Antipasti night on a Tuesday and a Spanish Tapas evening on a Wednesday as part of their themed culinary nights. Both AED 149 per person, 7pm – 10pm. Follow #CAKE on Facebook, Twitter, and Instagram! From one cheese addict to another I understand your deep contentment. Mmm cheese! 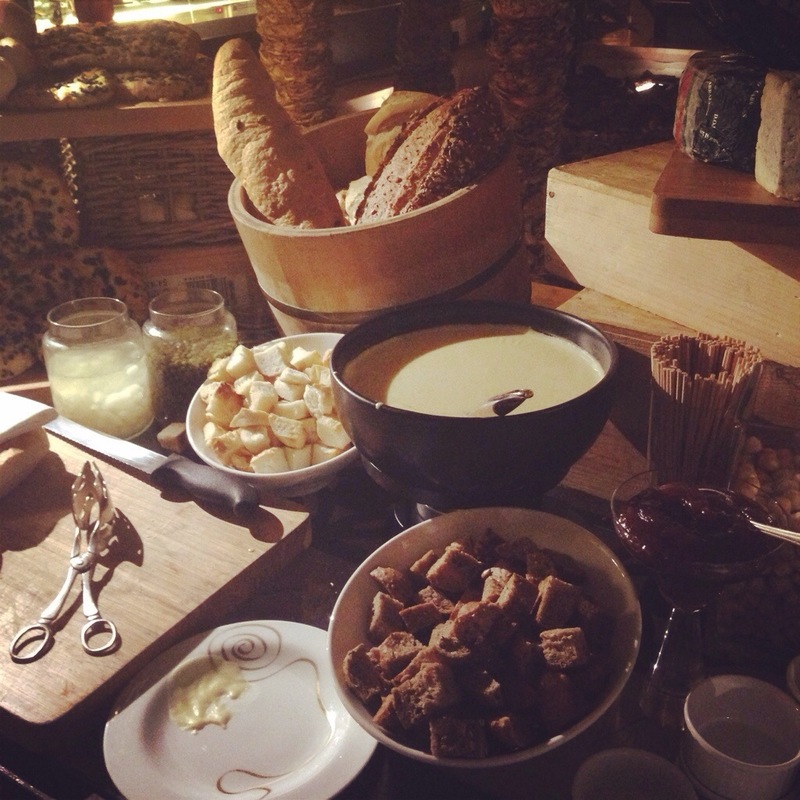 I’m heading to the Formaggio night at Radisoson Blu Hotel, Dubai Media City – hope it’s as good. You must check out Cave at the Conrad Dubai, absolutely marvelous! I have actually been to Cave – their cheese selection is INSANE. A little pricier, but totally worth it. You’ll have to let me know how the Formaggio night was!